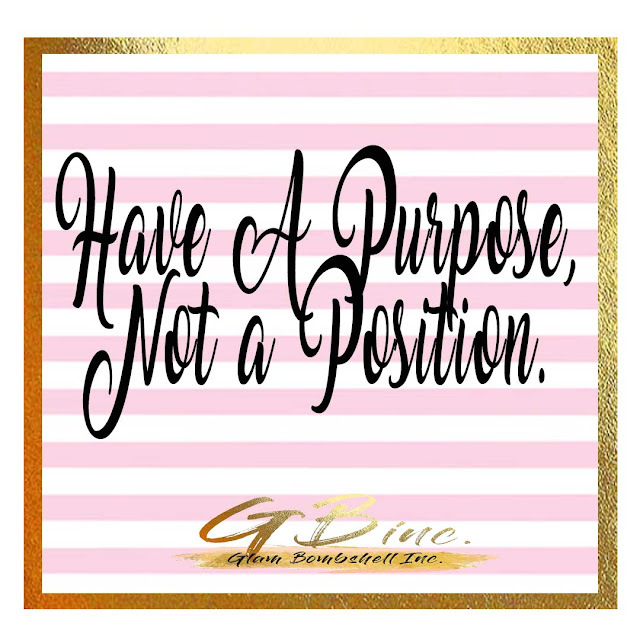 This quote was brought to my attention in a sermon in church on Sunday, "Have A Purpose, Not A Position," and it really played forward in my head all day. We are all trying to do great things in our life, and trying to find exactly it is that we are here to do, however, some may just be in it for the "position" or the "title". Is that all we are in it for, just the position? You cannot think that you will get far or succeed with your aspirations if you are only in it for the "position". I have had several doubts and disbelief of what is I am here to do for awhile. It took me time to actually figure out my gifts that I was giving, and the potential that was seen within me to actually see my purpose. I use to question myself, are these paths that I'm choosing really for me? However, I always found myself back down that road, and it was not for nothing. I have (still am) putting in work to state my purpose, and to live in it. How do we live in our purpose, and not just to hold a "position"? You have to put in work in order to see that progress for yourself. You cannot just expect things to happen for you if you are not putting forth any effort for the process. Being passionate for what you are instilled to do here on this Earth is the number one objective. Know how to execute what you are exceptionally and extremely passionate about. No work within your empire, is not an empire. You definitely cannot build a foundation without brick and concrete. We have to at some point realize that we are not here for a position. Really, you cannot be successful with just going after something for the position or title; it will never work. You will fall, you will fail, and you will be back at square one. Continue to push forward with your dreams and aspiration. Do it because you are passionate about, not because it comes with some type of luxurious title. Make it worth while Bombshell.